The stage is set for the Lake Harvest Kariba Challenge, a 21km road race and one of the toughest half marathons on the African race calendar. A number of elite local and international runners have confirmed participation in the event organised in August annually. One of Zimbabwe’s top ultra-distance runners Marko Mambo, who raised the country’s flag high in this year’s Comrades Marathon (90km) in South Africa where he finished in a fifth place in 5 hours 37 minutes 49 seconds, has confirmed participation. Held annually over the August long Heroes Holiday weekend, the challenge also includes a 10km race and a very popular 2km Baby Race for the under 8’s providing an epic backdrop to the event, amid the surrounding wildlife. Now in its 13th year since the inaugural event in 2005, over 1 000 runners look set to participate as the event attracts other elite runners like Kelvin Pangiso, who came out 4th at Pyong yang in Korea in 2016. He represented Zimbabwe at the World Champs and is the former winner of Kariba 21. Munyaradzi Jari (Kariba half marathon position two in 2017, Wellington Warevi (10th at the World Country Championships in 2017) among others are set to participate during the event. Race director, Robert Currie, said the event has been going on for a number of years now and has grown in stature with the number of local and internationally acclaimed athletes confirming their participation. “This event has been going on for 13 years now and has grown over the years. 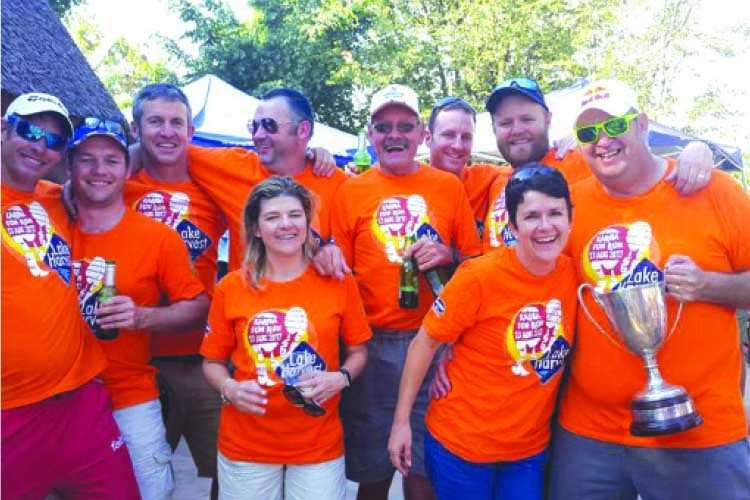 Harare Round Table Number One took over the organisation and management of the Kariba Fun Run in 2015 and Lake Harvest are the prime sponsors. “Their support of the event has grown over the years in line with their goals of putting Kariba back on the tourism map in Zimbabwe and also promoting healthy living. “The 21km and 10km routes are very challenging with many tough hills to climb but also very beautiful with views of Lake Kariba and we are expecting 1 000 runners. The 21km runners also get the added bonus of running across the Kariba Dam wall. “There will only be 600 medals given out at the Lake Harvest Kariba Challenge and only for the 21km race,” he said. Currie said the event is the central attraction for locals and visitors to Kariba over this long Heroes weekend whilst presenting an opportunity to benefit Kariba economically. “We have heard it is very hard to find accommodation now so most hotels and lodges are fully booked and then there are all the downstream benefits of tourists spending their money in Kariba. There is also the long-term benefit of raising the profile of Kariba as a tourist destination and attracting foreign tourists, so we want to get Kariba back on the tourist map, “he said. Currie added: “Along with all the runners there are a large number of supporters both friends and family who attend to support the runners and enjoy the entertainment for the rest of the day. Our focus this year is a weekend of entertainment. Harare Round Table Number One is a non-political, non-sectarian association open to men between the ages of 18 and 45, from any profession or trade. A weekend of entertainment where all proceeds support The Lake Harvest Kariba Challenge is an event in support of various charities including the Kariba Animal Welfare Fund Trust (KAWFT), The Tony Waite Organisation & Greenwood Park. “Harare Round Table Number 1 is a charity organisation and our goal is to raise funds from this event and donate these funds to worthwhile causes. In 2018 we will be supporting the KAWFT (Kariba Animal Welfare Fund Trust), The Tony Waite Organisation and one Round Table charity. “KAWFT does amazing work in Kariba looking after the local wildlife, anti-poaching, snare sweeps etc. The Tony Waite Organisation is also based in Kariba and they do fantastic work in the local community with AIDS awareness work and supporting people affected by HIV and AIDS,” Currie explained. Gold Sponsors include, Tanganda, that supplied all the Tinga Mira Water, Dendairy, NMB, MC Meats and Nyaradzo Group. Silver Sponsors: Irvines, Fuchs, Swift, Padenga, Cartrack, Crispy Fresh, Delta, Corky’s, Surrey, Lobels, Stumble Block, Econet, Drifter House Boats, Pick ‘n Pay, Cimas and African Century Leasing. The winner of the men’s 21km last year was Jacob Mugomeri in a time of 1hr 5min 37sec. The ladies 21km winner was Olivia Chitate in a time of 1hr 20min 18sec..